I’m not entirely sure where this idea came from. It kind of just crept into my brain and wouldn’t leave until I tried it. I also really like alliterative titles. 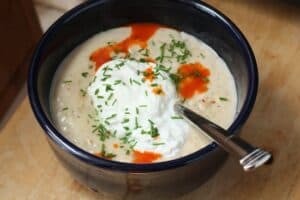 The idea for the dish is very loosely based on the traditional Congee breakfast dish which is a rice porridge that can be loaded with all kinds of toppings. I had some oats that I thought might work nice for the porridge base so I used those instead of rice. Instead of making a bland porridge base and loading it with toppings, I decided to make a spicy porridge base and then go light on the toppings.For some reason I like spicy things in the summer so I thought this would be a good breakfast! This was really savory and I liked it a lot. I served it with a poached egg which chills out the heat from the pepper a bit. It was actually a really filling breakfast! Yummy porridge with red and black peppers. I served it with a poached egg and some crusty bread to help with the heat! 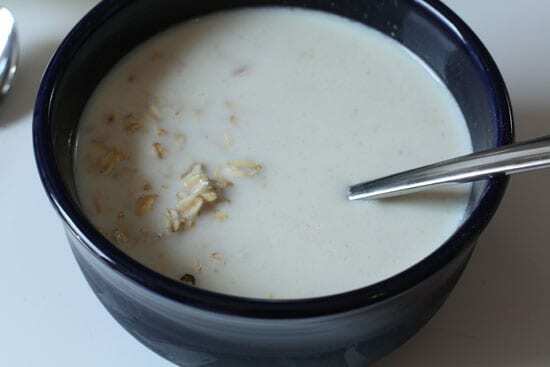 1) Soak oats in milk for at least 20 minutes, but you could also do overnight. 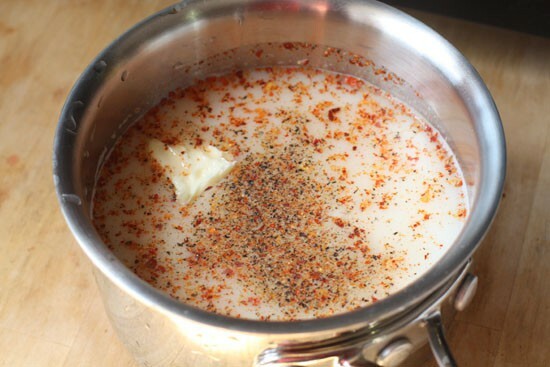 2) After soaking, add the oats and milk with the water, butter, and whatever peppers you are using (dried, or crushed red pepper, or black pepper) to a medium saucepan. 3) Bring the porridge to a simmer and then reduce the heat to low and stir for 15-20 minutes until it’s thick. 4) To poach the eggs, add a few Tablespoons of white vinegar to a medium pan filled half-way with water. Bring mixture to a simmer, but not boiling. Boiling will break up the eggs. 5) Crack eggs individually in separate bowls to make sure you have no shells. Then gently roll the eggs into the simmering water. Stir gently with a slotted spoon. Cook eggs for 2-3 minutes for a runny center. 6) Remove eggs with a slotted spoon and drain them briefly on a paper towel. 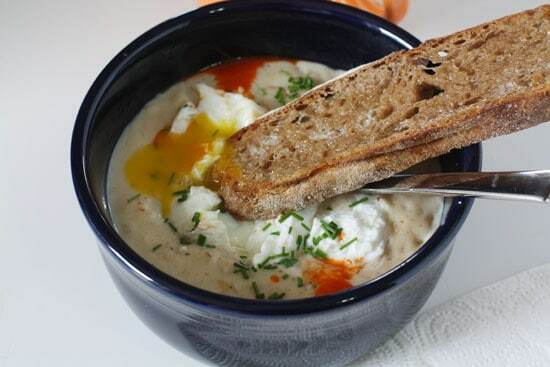 7) Add eggs to porridge bowl and garnish with hot sauce, chives, cheese, or more salt and pepper. Serve immediately! So let me start with a warning: I’m not a porridge expert. My plan was soak the oats for awhile to let them dissolve a bit and then cook them with a fair amount of liquid. I didn’t want the porridge to be too liquidy, but I definitely wanted it more soupy than a standard oatmeal. I started by soaking my oats in milk for about 20 minutes. Honestly, if you were in a time crunch I bet you could soak these overnight. After all, the whole goal is to get them to break down a bit. Oats in milk = Boring. I think if I made this again, the one change I would make is to use real dried chile peppers. Maybe an ancho pepper with some arbol peppers for heat. 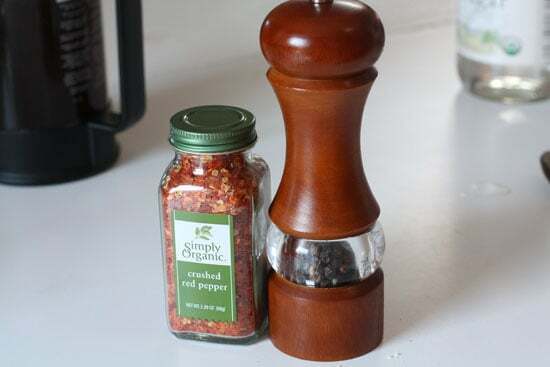 I just used a combination of black pepper and crushed red pepper. It was definitely spicy but I think I could’ve gotten some better pepper flavors with whole peppers. 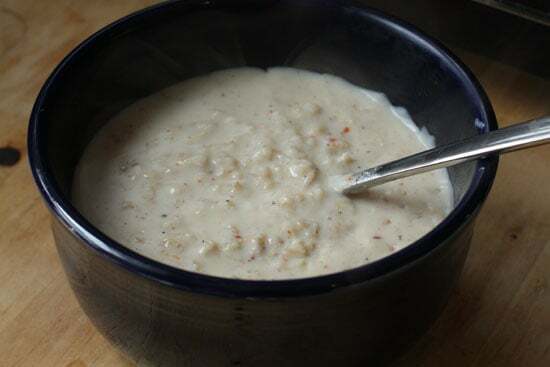 Once your oats are done soaking, add them and the left over milk to a small saucepan with the water, a nub of butter, the salt and sugar, and the peppers. At this point, I was thinking this was maybe not going to work! I was a bit worried at this point. Bring this mixture to a simmer, stirring often. After about 15-20 minutes on low heat, it should thicken into a very nice porridge consistency. Just for the record, if you don’t want the spicy version, you can leave out the peppers and add some brown sugar and maybe some dried fruit for a really awesome sweet variety also. But this was my finished pepper porridge! 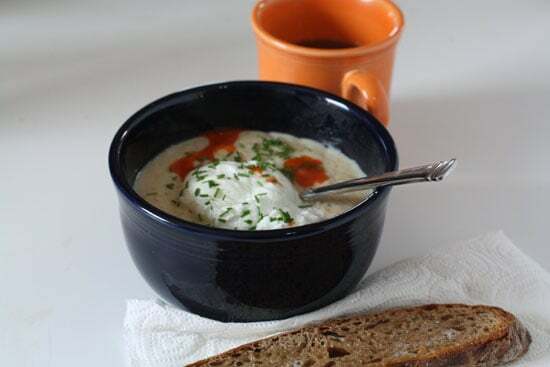 Poaching eggs is really simple and one of my favorite things for breakfast (or lunch or dinner). All you really need is a large pot, water, a big spoon (slotted is best), some white vinegar, and eggs obviously. Poaching an egg is as simple as bringing a large pot of water to boil and adding about 1/2 Cup of vinegar for every gallon of water. I usually just eyeball it. 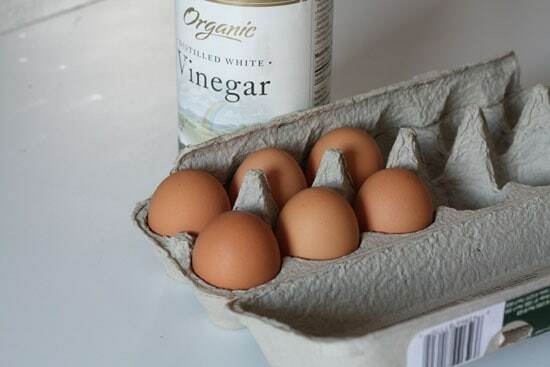 The vinegar helps the egg stay together so it doesn’t just spread out when it goes in the water. Once your water is simmering (not boiling – that’ll just rip the egg apart as it cooks), crack your egg in a small bowl and then slowly slip it into the simmering water. The egg will take about 2-3 minutes to cook for a runny yolk. If you want some photos of this process, I did some more thorough photos when I made this warmed green salad. 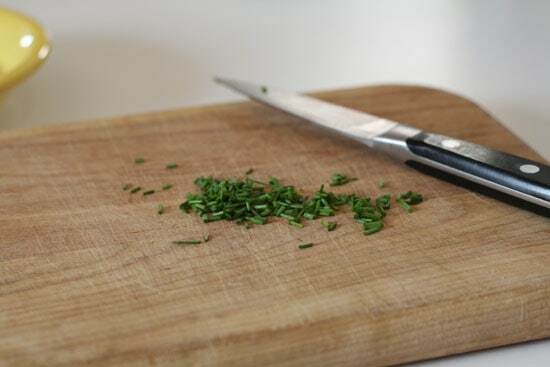 While your egg is cooking, you could chop up some chives for a nice garnish and a bit of onion flavor! Once your egg is done, drain it using the spoon and add it straight to your porridge. I added my chives, a few dashes of hot sauce, and served it with some crusty bread! Of course, the bread is for dipping! I can definitely see why Congee is such a hit. I can imagine a ton of toppings that would be great on this dish. You could do a number of meats (pulled chicken, bacon, or maybe even shrimp). Pickled vegetables would be nice. Or I think you could even go the sweet route with some brown sugar or honey. Sweet and heat go great together! If you’re up for something a little different, try this out! I really enjoyed it. Anyone else a fan of breakfast dishes like this? What other toppings do you think might work? I still like sweet oatmeal breakfast with maple syrup. However, if I have to add more toppings, I will add what I would normally like as sides with my breakfast or in my omelet. Bacon is excellent choice. Other I would think is caramelized onion or some grilled/sauted veggies. Nick, like you, I love a good poached egg, but after one too many egg disasters, I gave in and purchased some of those silicone poach pods. I'll never go back. Now my poached eggs are eggtastic everytime! Congrats on a wonderful example of thinking outside the box! Love it. And I promise to give it a try. I don’t know. I like that this has opened my mind, but I’m thinking maybe I’d like spicy grits with the poached best. But, then again, if I taste it, I might think differently. OKAY! This…. ROCKED! It was perfect! I just substituted the Poached Egg with a soft boiled egg. I loved it, and I am making it again tomorrow! Thanks a ton Nick :) I am in love with your site! I tried this because I love spicier foods, and also because using heat instead of sweet reduces the calories. I did the egg, lots of hot sauce, and subbed a salted seasoning rub for the salt and red pepper…. and LOVED it! I was very full and then energetic on my bike ride, great fuel!